Truth in advertising: the composition of frames in this series isn't always this interesting. Episode 25 of Bakuman has aired, bringing the first season to a close. Here I survey reactions from around the ani-blogisphere before concluding with my own perspective. To the studio! First for my tour of the ani-blogging commentariat. The general impression seems to be that the show was at least a bit disappointing, but most people have something positive to say. Specifically the show has been criticized for directorial decisions, especially poor pacing, and emphasizing a romantic sub-plot that didn’t deserve it. 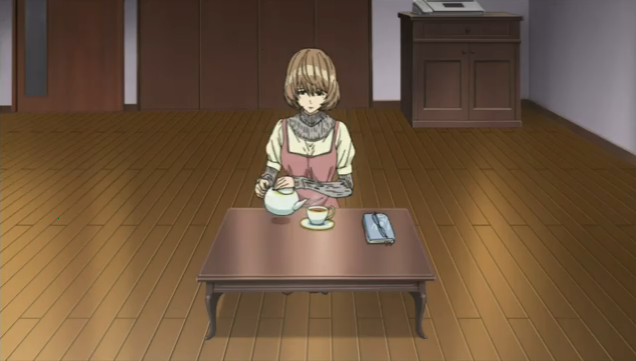 The last few episodes were notable for achieving more tension, and sucking us into the world of manga professionals. First, I completely agree with those who criticize the pacing on this show. I like slice of life, but I am far from convinced that that is what the production team set out to achieve. As proof I would point out that the series was much more effective when it turned its attention to the rivalry between Ashirogi Muto and the others competing for the Golden Future cup and the opportunity to be serialized. Competition is not the stuff of slice of life stories (observing natural cycles is a better subject for the genre); competitions are shounen, and I think this is what the show was trying to be all along. At the very least I would say that it was most effective as a shounen story, which generally involves the struggle to get better, compete with rivals, and become number one. I have only met one person in my life that has lived in a room this sparse. She had previously lived in a kayak. A f*king KAYAK. I don't believe Aoki lived on a Kayak, and I don't believe she lives in this environment. On the other hand, it is difficult to dismiss Bakuman, because there is obviously something there, but what is it? The “adult world” of Jack seems to have many unique characters, but, oddly, the main characters all have a blandness to them. Perhaps this is mainly the character designs, which, for younger characters (including the leads) always seems to include an ice cream cone shaped face. This artistic laziness seems to have extended into the depictions of the environments the characters inhabit, with the notable exception of Ashirogi Muto’s studio. For me, that something that I don’t want to dismiss is that there were glimpses of people pursuing their careers. As I have written before, “For some reason, the anime and manga aimed at boys and men that gets translated into English never addresses this aspect of our existence. Oh, sure, if the job is piloting a giant robot to save the world from aliens, or if the male lead is a spy with super powers, we get to see some workplace drama.” In a comment, Sapphire Pyro mentioned Bakuman as a series with this sort of setting and focus. These glimpses of office life with Hottori and the others were brief, and bunched towards the end of the first season. Is this a harbinger of good things to come, since a second season has been announced? Simply put, if you have no interest in the life of a professional artist, I can not, at this point, recommend Bakuman. For those looking forward to a decent (if generic) shounen series that aired this season, check out Cardfight!! Vanguard. 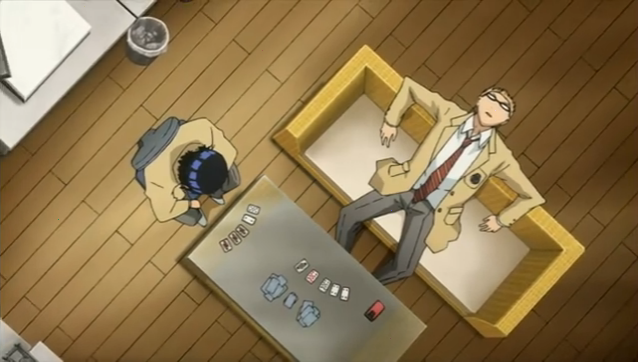 In fact, I kind of wish the director of Bakuman had checked out Cardfight!! Vanguard, before working on this. The one thing Cardfight!! Vanguard was lacking was that it was a completely generic story (the one thing you can really credit Bakuman for). Even Cardfight!! Vanguard‘s romance was better than Miho X Moritaka. I, however, will undoubtedly watch the announced season 2 of Bakuman, in the hope that the glimpses of professional life will become more prevalent the substance of the story [edit: after RP’s comment below]. I’m surprised you’re willing to give the second season a go, after all the mediocrity of the first season. I am interested in exactly the point we arrived at by the end of the first season. 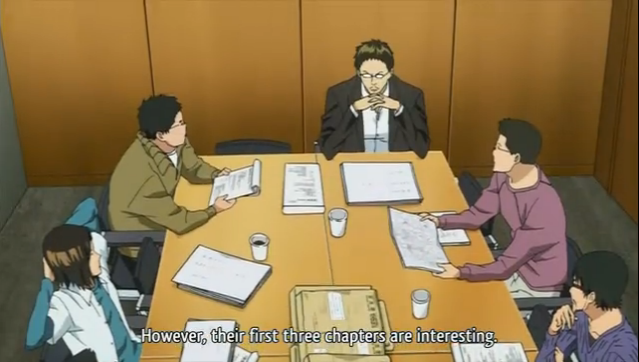 That is, I view the first season as being the story of how the pair got to enter the world of professional manga. All the things I liked most about the series seemed to be glimpses of what they might be able to do once they went pro. I might be let down, but I am interested in checking out season two in hopes of seeing the REAL story. I agree with your comments about compressing this background material, though. 25 episodes was too much for this section.